What is the Mobile Dome Planetarium? 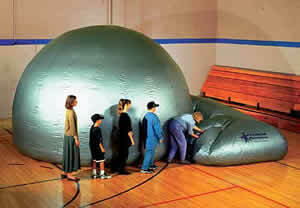 The Mobile Dome Planetarium is an inflatable traveling classroom, which fits in your gymnasium, average sized classroom, or on an auditorium stage. 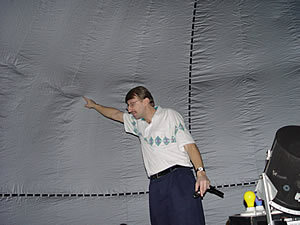 The fabric dome inflates with a fan, and requires a floor area of 25x25 feet with a minimum ceiling height of 11 feet. The set-up area MUST BE QUIET to ensure maximum learning potential! Who Owns the Mobile Dome? Astronomer and Director, Mr. Paul J. Krupinski (Mr. K.), owns and operates this traveling star theatre. Mr. K. is also on the educational and technical staff of the world renowned Strasenburgh Planetarium of the Rochester Museum and Science Center, as well as a member of The International Planetarium Society, The Great Lakes Planetarium Association, and is current President of The Middle Atlantic Planetarium Society. How Many Can Visit at One Time? This is a small room and larger groups (30+) will not be comfortable under the dome. Please conform to the suggested numbers above or simply call me for more information. All prices are listed for the 2016-2017 school year. The prices listed in the table below reflect my actual expenses to transport, unpack, set up, operate, and repack the Mobile Dome Planetarium equipment. There are NO contracts to sign and NO deposits necessary to book an appointment to have the Mobile Dome Planetarium for your class or event. If you have other questions about astronomy or planetarium related items like scheduling or whether programs meet New York State standards, simply contact us. We would be happy to chat with you!